The 48-year-old actor was emotional as she walked up to the stage to receive her first Oscar award. She paid tribute to Baldwin's writing, calling him "the greatest artist of our time." 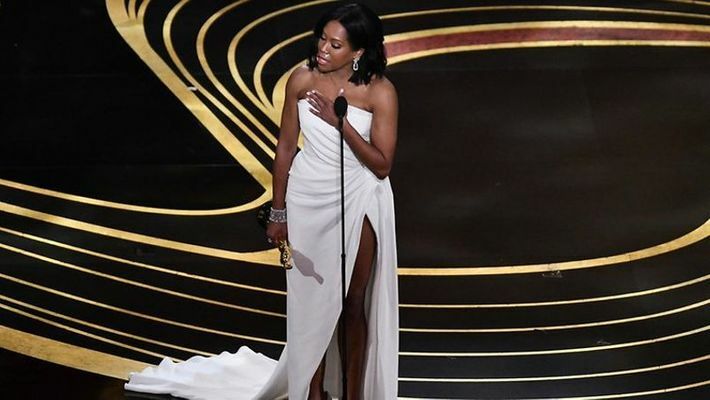 Regina King won her first Oscar trophy in the Best Supporting Actress category at the 91st Academy Awards for her performance in Barry Jenkins' "If Beale Street Could Talk". Based on the novel by literary icon James Baldwin, the film follows the romance of two young African-Americans, Tish (Kiki Layne) and Fonny (Stephan James), who strengthen their bond through an unexpected pregnancy and are nearly torn asunder by wrongful imprisonment. King plays Sharon Rivers, mother to Tish, who is a fierce advocate for her daughter and fights valiantly to prove Fonny's innocence. "This is a little surreal. James Baldwin birthed this baby and Barry nurtured her and surrounded her with so much love and support. So it is appropriate for me to be standing here because I am an example of what it looks like when support and love is poured into someone," she said in her speech. Rachel Weisz ("The Favourite"), Marina de Tavira ("Roma"), Regina King ("If Beale Street Could Talk") to take home the award. King, who brought her mom Gloria along to the 2019 Oscars, also thanked her for teaching her that "God is always leaning". "If Beale Street Could Talk" is also nominated in the Best Original Score and Best Adapted Screenplay categories. The Oscars, which have gone hostless this year, opened with riveting performance by Queen+Adam Lambert.